Tuesday and Thursday, March 6th through April 13th, 2019. 10:00 am to 1:00 pm. 6-week course, 36 hours of classroom instruction, plus assignments completed independently through our LEARN online instruction portal. 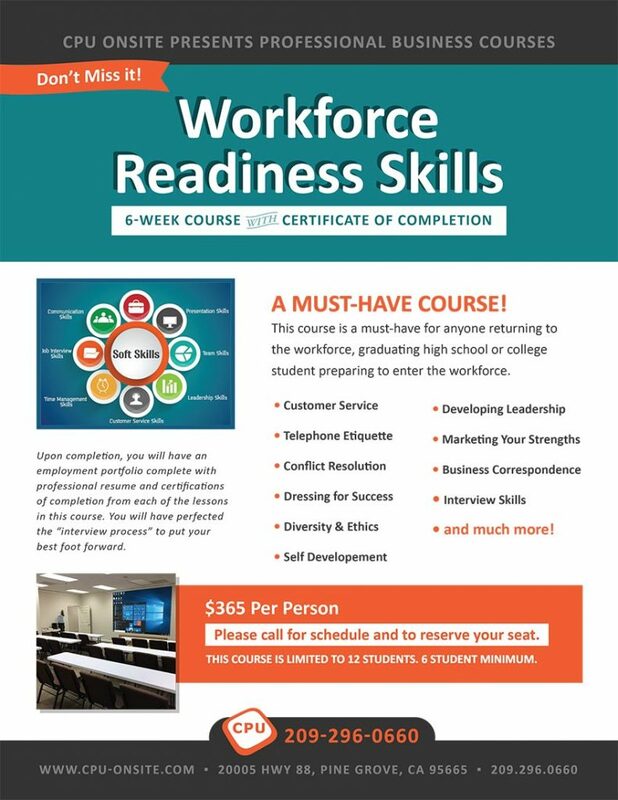 This course is a must-have for anyone entering or returning to the workforce, graduating high school, or a college student preparing to enter the workforce. Upon completion, you will have an employment portfolio complete with professional resume and certifications of completion from each of the lessons in this course. You will have perfected the “interview process” to put your best foot forward. A sampling of lessons includes, but is not limited to, customer service, telephone etiquette, conflict resolution, business correspondence, dressing for success, business negotiation, standard office procedures, Microsoft Office basics, marketing your strengths and much more. A Minimum of 6 students enrolled in this course is required for this course date.